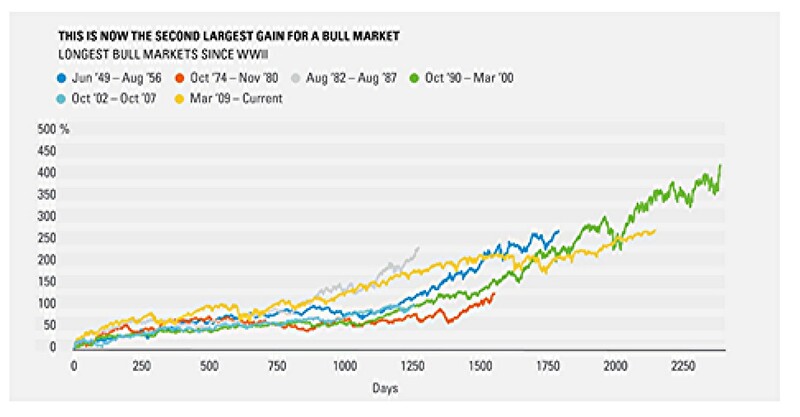 With the benefit of hindsight, it’s easy to think that the long eight-year ride was easy money; you just put your chips on the table when the market hit bottom and let them ride the long bull all the way to where we are today. We tend to forget that staying invested is actually pretty difficult, due to all the white noise that tries to distract us from sound investing principles. Consider, for example, that initial decision to invest in stocks in March 2009. We had just experienced the worst bear market (down 57.7% from the peak in October 2007) since the Great Depression, and we were being told many plausible reasons why prices could go lower still. After all, corporate earnings were dropping from already-negative territory. Was that the time to buy, or should you respond by waiting out the next couple of years until a clear upward pattern emerged? The following year, investors were spooked by the so-called “Flash Crash,” which represented the worst single-day decline for the S&P 500 since April 2009. Then came 2011, two to three years into the bull, when the S&P 500 declined 20% from its peak in May through a low in October. The pundits and touts proclaimed that another recession was looming on the horizon, which would take stocks down still further. Surely THAT was a good time to take your winnings and retreat to the sidelines. The headline distraction in 2013 was rising interest rates, which were said to be the “death knell” of the bull market. Low rates (it was declared) were the “reason” for the incredible run-up from 2009-2012, so surely higher rates would have the opposite effect. The “experts” were wrong. The S&P 500 would advance 32% in 2013, its best year since 1997. In 2014, the U.S. dollar index experienced a strong advance, as markets began to expect the U.S. Fed to end its QE program. A falling dollar and easy Fed money were said to be responsible for the “aging” bull market, so this surely meant that it was time to head for the exits. Instead, the index ended 2014 with a 13.7% gain. The following year, a sharp decline in crude oil prices was said to be evidence of a weakening global economy. In December 2015, the first Fed rate hike since 2006 led many institutional investors to sell their stocks in the worst sell-off to start a year in market history. The 52-week lows in January and February were said to be extremely bearish; the market, we were told, was going much lower. Instead, the S&P 500 ended 2016 up 12%. Today, you’ll hear that the bull market is “running out of steam,” and is “long in the tooth.” New record highs mean that there is nowhere to go but down. In other words, you are, at this moment, subject to the same noise—in the form of extreme forecasts, groundless predictions, prophesies and extrapolation from yesterday’s headlines—that has bombarded us throughout the second-longest market upturn in history. This is not to say that those dire predictions won’t someday come true; there is definitely a bear market in our future, and several more after that. But investors who tune out the noise generally fare much better, and capture more of the returns that the market gives us, than the hyperactive traders who jump out of stocks every time there’s a scary headline. As we look back fondly at the yellow line in the middle of the graph, let’s recognize that holding tight through big market advances and allowing your investments to compound is never easy. But it can be extremely profitable in the long run.